​SPP and TcP02 / TCOM both assess microcirculation; however, SPP is proving to be faster, more efficient, and more cost-effective test. A primary use of SPP and TcP02 is to assess patients with lower extremity ulcers (often patients with diabetes) to determine if there is adequate blood flow at the location of the ulcer to achieve a healing outcome. 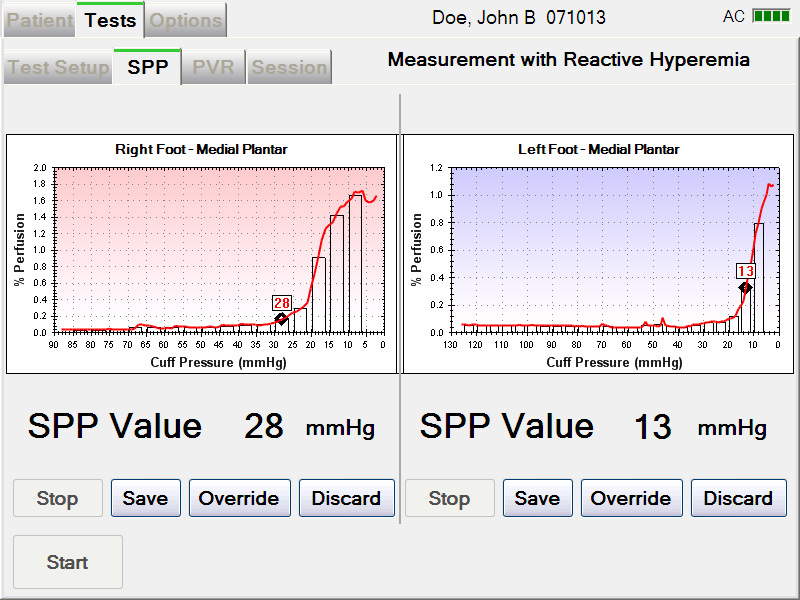 SPP measures perfusion directly by identifying the onset of tissue perfusion as cuff pressure is released. 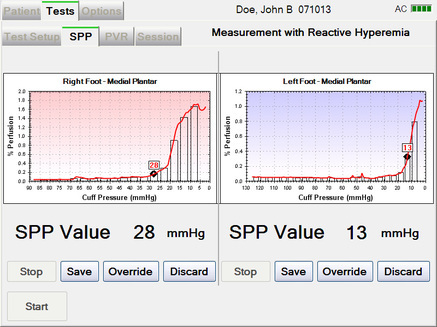 SPP is the cuff pressure measured in mmHg when perfusion first returns. TcP02 measures perfusion indirectly through the partial oxygen tension pressure by attaching heated electrodes to the skin that raise the skin temperature and increase blood flow (oxygen) on the surface. How well does the test result correlate to actual clinical outcome? Published comparisons between SPP and TcP02, SPP has been found to be more accurate in determining probability that a patient will respond, or not respond to wound care therapy. TcPO2 tests typically require 45-60 minutes to perform. SPP tests can be usually be completed in 10 minutes; very complex patients with multiple site SPP assessments can often be completed in less than 20 minutes. TcPO2 is contraindicated on the plantar foot because the thickness of the skin inhibits an accurate test result. Diabetic foot ulcers are usually on the plantar foot. Since this angiosome is related to the posterior tibial artery (the most likely tibial artery to occlude), the inability to assess this angiosome impacts diagnostic accuracy. SPP has no anatomical restrictions when testing the lower extremity. TcPO2 is not recommended for patients with edema. This is not a limitation of SPP. TcPO2 devices are sold typically priced $10,000 to $15,000 higher than PAD-IQ. ​​SPP was found to be a better predictor of wound healing outcomes than TcPO2. SPP was easy to use and demonstrated a high degree of accuracy. 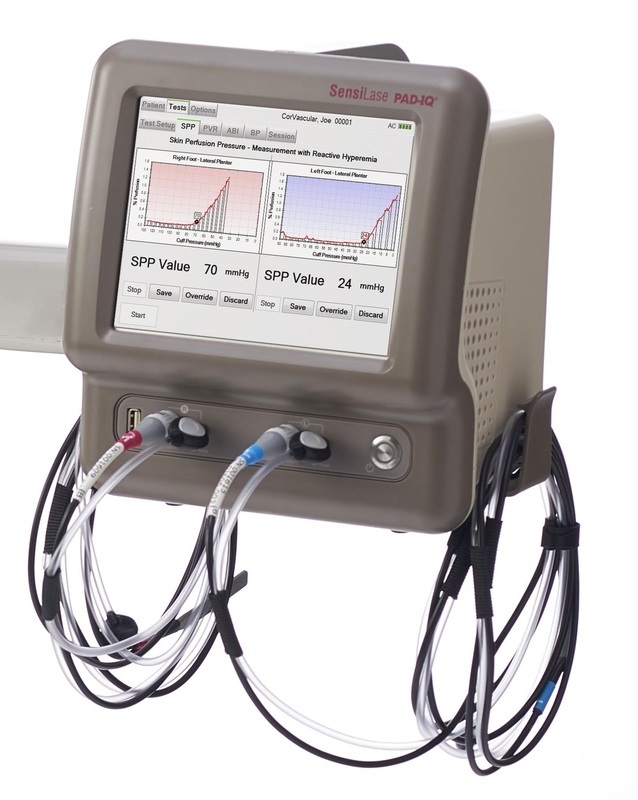 While it appears that both SPP and TcPO2 measurements have complimentary applications in various diagnostic and therapeutic protocols, SPP is emerging as a reliable and objective measurement tool in wound evaluation and other distal arterial assessments.